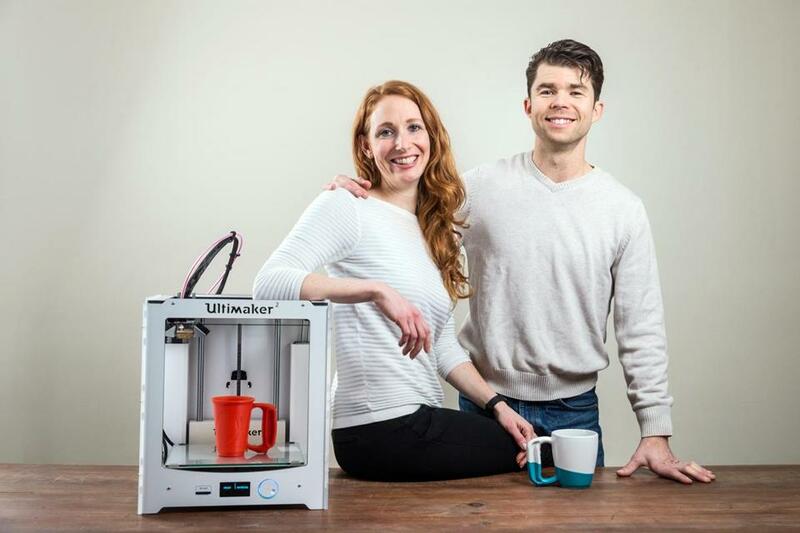 Diana and Allen Arseneau, Jamber cofounders, with a 3-D printer used to prototype the product. Does the world really need a better coffee cup? What if it’s so good it’s “life changing,” in the words of Allen and Diana Arseneau, the husband-and-wife team behind Jamber, the company that’s come out of their effort to create cups that are easier to hold. The idea came from a visit to Allen Arseneau’s 84-year-grandfather, who suffers from arthritis and was struggling to grasp his coffee mug. “If his hand hurt, I suspected other people’s did too,” Arseneau says. He notes that typical cups are also challenging for those with hand weakness or who lack fine motor skills. The couple had worked in the biotech and pharma industries (Allen, 39, has a biochemical engineering degree from Northeastern and a Stanford MBA, and Diana, 33, a chemistry degree from Harvard), but decided better coffee cups could help them have a far faster impact on people’s lives. They started working full time on Jamber in September 2014, backed by some small investments from angel investors. The main difference between a Jamber cup and a regular one is the handle. Jamber’s handle sticks out like one of Dumbo’s ears, which allows for a full-fisted grip instead of the usual thumb-and-two-fingers “pinched” clasp. The handle slopes downward and has a stabilizing nub at its base. It took 2½ years to perfect the handle design, which has received four patents, with more pending. Manufactured in two sizes, at 0.8 and 0.9 pounds the microwave- and dishwasher-safe stoneware cups weigh fractionally more than mugs of similar capacity. They got some advice early on from Karen Jacobs, an ergonomist and professor of occupational therapy at Boston University (she later was given a small stake in Jamber). Jacobs says conventional coffee mugs present difficulties for people with physical challenges, whether age-related or from diseases like multiple sclerosis. That’s why Jamber focused on sales to senior centers for its first couple of years. But late last year it began selling the cups directly to consumers on jamber.com. The company is adding specialty designs, like the Vivian Mug, which raises money for a customer’s 5-year-old daughter, who has an aggressive case of neuroblastoma. A customer-specific cup may seem an unusual product for a small company, but Allen Arseneau, who says he grew up on welfare in Brighton, benefited immensely from the Big Brothers Big Sisters program, which he remains involved with, and looks for opportunities to help others. On April 1, the Hull-based company plans to add ergonomic dinner plates, bread plates, and bowls, currently available for pre-order. (The cups are made in the United States, the other pieces in China.) Jamber also has an 8-ounce tea cup with a flared lip for easier sipping and drinking. 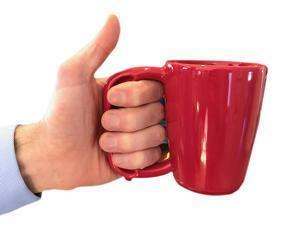 Coffee mugs come in 12 ounces or 16 ounces. John Dodge is a freelance journalist in West Newbury. Send comments to magazine@globe.com.